Joy treats have an unbeatable taste! These treats are soft and chewy for all breeds. 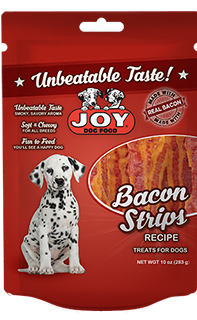 Joy Bacon Strips (made with real bacon) are fun to feed and you will see a happy dog. Intended as an occasional snack, treat, or reward only, not as a complete or in lieu of a nutritious diet. Don’t over do it; make sure your pet gets plenty of water and exercise.